A rare venture into pure drama, Woody Allen's Another Woman (1988) shares many elements and themes with Ingmar Bergman's Wild Strawberries; not surprising, given his other ties to the Swedish director. Produced during the middle of his on-and-off relationship with star Mia Farrow before he had an affair with her adopted daughter (whoops), Another Woman has aged quite well within Allen's filmography despite its complete lack of laughs. 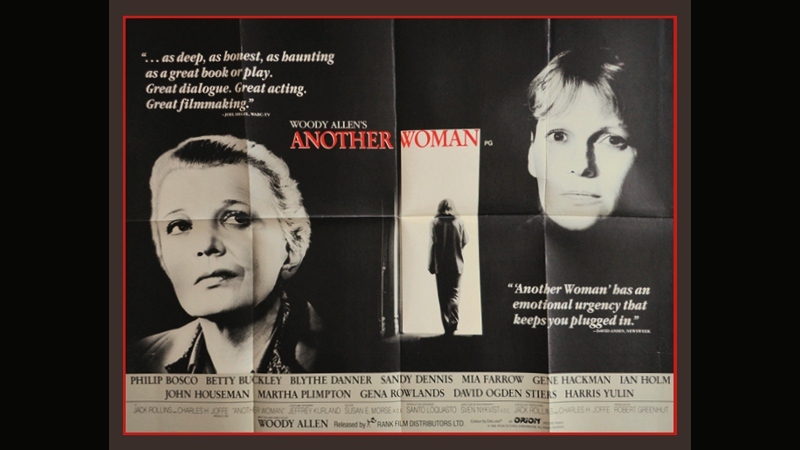 Shot by celebrated cinematographer Sven Nykvist, a frequent collaborator of Bergman's, Another Woman impresses with its warm, lived-in atmosphere and a terrific ensemble cast that includes Gena Rowlands, Ian Holm, Mia Farrow, John Houseman, Blythe Danner, Frances Conroy, Martha Plimpton, Gene Hackman, and David Ogden Stiers. At a brisk and almost fat-free 81 minutes, Another Woman does a fine job of building drama in relatively short order. 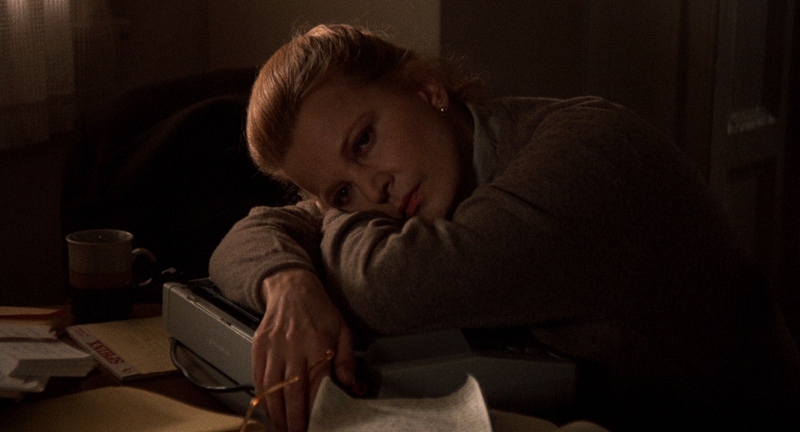 Our story follows philosophy professor Marion Post (Gena Rowlands, who does most of the narration) during a creative drought, as the fifty-something has recently sub-leased an apartment away from construction work near her home. But peace and quiet don't come quickly: before long, she's disturbed by voices from an adjacent apartment rented by a therapist, and Marion grows curious of the conversations. Perhaps the most intriguing patient is Hope (Mia Farrow), who seems equally uncomfortable in her own skin. 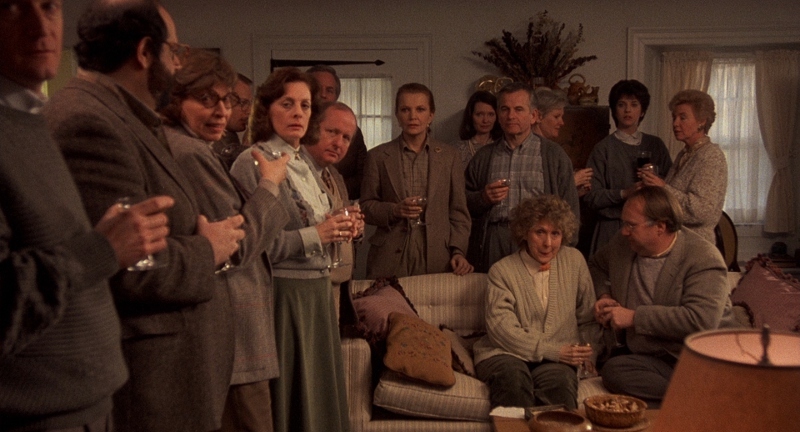 From there, Marion re-evaluates her relationships with friends, family, and others: her elderly father (John Houseman), brother Paul (Harris Yulin) and his estranged wife Lynn (Frances Conroy), old friend Claire (Sandy Dennis), first husband Sam (Philip Bosco), stepdaughter Laura (Martha Plimpton), current husband Ken (Ian Holm), his friend Larry (Gene Hackman), and herself. There are a lot of character dynamics to process at times, and to Another Woman's credit it juggles many of the balls quite well. 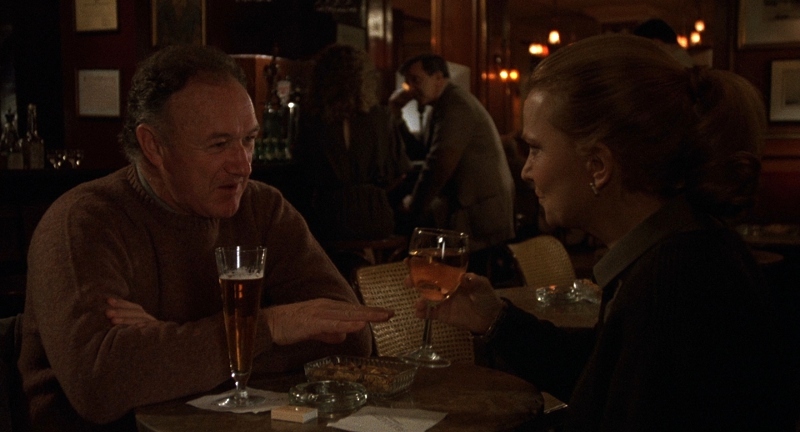 This is almost completely due to the honest and natural performances of all involved (especially Rowlands, Holm, and Hackman, who share many memorable scenes together); they feel extremely organic and are given plenty of room to breathe. The linear structure is also broken up a few times by several well-done dream sequences and a handful of flashbacks: some shed light on Marion's earlier years, and others represent her dreams and dormant thoughts. Overall, this is an effective and at times moving story, one that does owe many of its strengths to Bergman but also carves out its own identity in the process. Twilight Time's new Blu-ray arrives almost 17 years after MGM's 2001 DVD, serving up a sparkling new 1080p transfer that fans and first-timers will appreciate. MGM's 2001 DVD of Another Woman was lackluster, which makes Twilight Time's brand new Blu-ray seem even more impressive in direct comparison. This 1080p transfer was obviously sourced from a new or recent restoration, as it's exceedingly clean and wonderfully consistent in texture and tone from start to finish. Image detail, film grain, and black levels are much improved overall, and the warm browns and golds of Sven Nykvist's cinematography give Another Woman a warm and lived-in atmosphere. Nighttime scenes and low-light interiors also look great. The disc is also encoded well with no flagrant digital issues (compression artifacts, excessive DNR, etc. ), serving up a pleasing film-like presentation that's likely the next best thing to a theatrical showing. Without question, this is best it's ever looked on home video and Twilight Time's Blu-ray will impress fans and first-timers of all ages. DISCLAIMER: The images featured in this review are strictly decorative and do not represent the title under review. The audio is presented in either DTS-HD Master Audio 2.0, which replicates Another Woman's original two-channel mix perfectly well. Dialogue and background effects are balanced well and rarely fight for attention. As this is an almost entirely narrative-driven film, there's not a great deal of activity or depth but what's here sounds fine with no apparent defects or damage along the way. Optional English subtitles have been included during the main feature, as well as a separate lossless Isolated Music Track likewise presented in DTS-HD Master Audio 2.0. The interface is plain but perfectly functional, with quick loading time and the bare minimum of pre-menu distractions. This one-disc release arrives in a clear keepcase with poster-themed artwork and a short Booklet featuring production stills, promotional artwork, and a brand new essay penned by Julie Kirgo. Aside from the isolated music track, bonus features are limited to the film's Theatrical Trailer (2 minutes)---not surprising for a Woody Allen film. Woody Allen's Another Woman, like his 1991 film Shadows and Fog (also available from Twilight Time), is atypical of his usual work but for completely different reasons. The drama is high and comedy almost completely absent, as this cousin of Ingmar Bergan's Wild Strawberries impresses with great performances and almost no fat along the way. This was my first time seeing the film in many years but it's aged very well---and while I'm still a decade away from its target audience, those who enjoy adult dramas will likely get a lot out of it. Twilight Time's new Blu-ray easily outshines MGM's 2001 DVD in the technical department with a fantastic 1080p transfer...although like most Allen films, the bonus features are still lacking. Recommended, but newcomers may want to rent it first. Randy Miller III is an affable office monkey by day and film reviewer by night. He also does freelance design work, teaches art classes and runs a website or two. In his limited free time, Randy also enjoys slacking off, juggling HD DVDs,fvvc and writing in third person.